This is a fund to support victims of the Camp Fire, which is currently growing in Northern California. 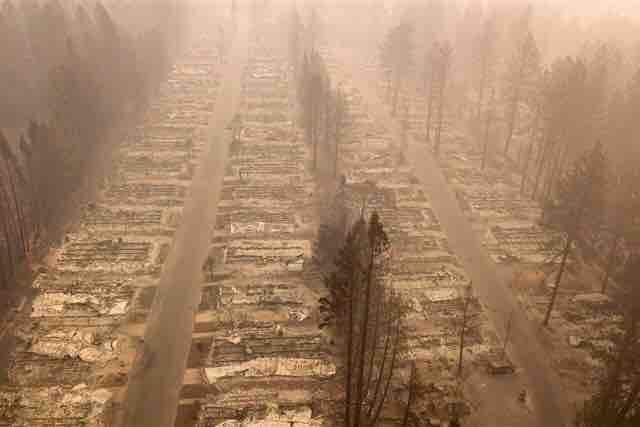 More than 50,000 people have been evacuated from Paradise, Magalia, and the surrounding area, and most of them will not have a home to return to. Paradise is where I grew up and a place of immense importance to me. I ensure every single cent raised (aside from GoFundMe fees) will be spent helping the victims of the Camp Fire recover from this tragedy. I'm starting with a modest goal of $50,000 (Update: Thank you!!! We reached our goal of $50,000, and are moving on to $75k. Every dollar helps! ), but the damages extend well beyond this number. I've never done a fundraiser like this, but I promise I will do my best to help people in need and communicate openly with the communities affected about how these funds are being dispersed. I'm told I should add some tidbits about myself, so here we go. I have an extensive history of nonprofit and volunteer work in Butte County as well as Oakland, where I live. I have been interviewed by ABC News and Huffington Post in relation to my work raising money for homeless residents in the Bay Area, and spend a significant amount of my free time working on issues supporting communities in need. I am hopeful that this conveys my commitment to these types of causes and my earnest belief in helping those in need. I'm pleased to announce that we've decided to donate all funds raised to the North Valley Community Foundation's (NVCF) Camp Fire Evacuee Fund. As this money is depositing directly to NVCF, there will not be fees attributed and all $64,650 (and counting!) will go to them. First, I'd like to thank Sahar Shirazi, who was a huge help throughout this process. Sahar spent a considerable amount of time doing research and reaching out to various organizations, and I am overwhelmingly grateful to have her as a friend. Second, let me go over the process that went in to this decision. GoFundMe only allows funds to be dispersed to a single organization, so we are coordinating with NVCF and Undocufund to put them in contact with one another and ensure that non-english speaking and undocumented people are beneficiaries of the funds raised in this campaign. This is an ongoing conversation, but since GoFundMe isn't allowing further donations or for NVCF to withdraw from this campaign until I make this announcement (which is a frustrating policy to have to deal with), I had to post this update immediately. In looking over NVCF, I was impressed by their low overhead (99% of donations go to evacuation shelters assisting those displaced by the Camp Fire), and also by their employee, Logan Todd, who was very friendly every time I spoke with him and whose commitment to helping people affected by this tragedy shined through again and again. Logan frequently responded to my calls and emails even after work hours, and I'm sure I'm not the only person who was trying to reach him. He and his colleagues at North Valley Community Fund really deserve our thanks for their tireless devotion to helping people in need. As for my part in this, I just want to thank everyone for the trust that was placed in me and the effort each and every one of you put in to helping those affected by this tragedy. It's cliche to say, but I can't think of a better way to phrase it: My heart is broken over this. I loved Paradise to the marrow of my bones, and it's devastating to think that my hometown is essentially gone. I don't know if you ever get over a tragedy like this; it seems like you only get better at thinking about it. That said, the kindness and generosity all of you have shown is one of the few things that draws light out of this darkness. In these difficult, turbulent times, it's nice to have a reminder that loving and helping one another is really what life's all about. Thanks again, everyone. It's been a little while so I wanted to provide an update. First off, we've raised nearly $60,000, which is incredible! Thank you everyone for your hard work and support in getting this cause the attention that it needs. The support of local businesses like The Kon-Tiki, The Pad Studios, Tacos Oscar, Dona Tomas, Ramen Shop, Kronnerburger, Henry's in Berkeley and Nye Ranch Farms (sorry if I forgot anyone else!!!) has been remarkable, and has helped raise awareness for this issue well outside its immediate area. Thank you all so much. On the distribution side of things, Sahar and I continue to contact funds and hold internal discussions on our next steps. I appreciate everyone's patience on this, as Sahar and I both hold full-time jobs and only have time to focus on our research for this outside of normal work hours. We are making inroads, answering important questions and beginning to reach consensus on some top choices. We look forward to announcing the funds we'll donate this money to as soon as we are able to. As there are still some businesses doing fundraisers for the event, I'm keeping donations open, though the pace at which our pool rises has slowed considerably. If you feel like it, please continue sharing and spreading the word. There are still tens of thousands without homes and without a solution in sight, and they will need our help well into the future. Again, thank you all for your support. As a person who grew up in Paradise and deeply loves its community, knowing that I have an opportunity to help these people in some small way has made a lot of dark days a little bit brighter. I appreciate your consideration and the trust you've put in me. Hi all, it's been a few days and I want to provide an update. First of all, we've raised nearly $40,000 in a week, which is incredible! Thank you all so much for your generosity and hard work to help spread the word. There have been more than 2,000 shares of this campaign and a continuing employment of creative methods for collecting donations (thank you to all businesses that have organized fundraising activities!). I'm overwhelmed by the support you all have shown. Please continue to share this campaign so we can reach our $50,000 goal and help these people who so desperately need it! I also want to provide an update on the process for investing the money you've donated. I am currently assembling a panel of trusted individuals to help guide the investment decision. I've reached out to individuals who successfully led GoFundMe fundraisers for other Northern California fires (such as the Santa Rosa fire), people with experience on disaster relief efforts, and people with organizing experience that can help us survey potential funds. To that end, I am happy to announce that Sahar Shirazi has joined our decision-making panel. Sahar is a former Obama Administration official who also spent years working for the Governor's office in Sacramento. Sahar knows bureaucracies - good and bad - and understands that disaster relief has no partisan affiliation. We are here to help as many people as possible as effectively as possible, and I trust that Sahar will help us make that happen. Regarding what we're looking for when surveying potential funds, I've listed groups we're particularly interested in helping below. The common thread between all these groups is that they are the ones that most frequently miss out on disaster relief funds. For a number of reasons, these people have less access to technology that could inform them of available funds, less time to apply for such funds, and have more difficulty getting to locations where they can apply. Like I've said many times, it is important that these funds are invested as effectively as possible, and ensuring a potential fund has novel approaches for reaching the parties listed above will help everyone's investment make the largest impact possible. Thank you again for all the support, hard work, and kind words. I hope to have more good news soon. Have a terrific weekend everyone! Hi all, there have been a lot of questions about the distribution of these funds so I want to offer some additional information. ONE OF THE MAIN QUESTIONS I'M GETTING IS WHETHER THERE IS A SIGN-UP FOR INDIVIDUAL FAMILIES, AND THE ANSWER IS NO. I want to ensure that no bias is shown towards any individual residents of the affected areas and that the money is used to do as much good as possible for the community-at-large. My plan at the moment is to find the best fund to send all donations to once we reach our goal. I am going to do my best to offset transaction costs from GoFundMe with personal money, so a full $50,000 can be donated once we raise it. So, why didn't I just ask people to donate to a specific fund in the first place? There are a couple answers to that question. 1) All I saw when I looked for donations on Friday was the North Valley Community Foundation Fire Relief Fund, which is distributed to all fire areas in the north state. Seeing the catastrophic damage to the towns of Paradise and Magalia, I wanted to ensure the money would stay in the affected area, and with no option to do that at the outset, I also wanted to start collecting money to help the victims as quickly as possible. 2) I don't want to rush to judgement. The effects of this fire will be felt for weeks, months and years. I want to look over GuideStar and Charity Navigator records for all funds, speak with representatives from these organizations, and really know that this money is being invested responsibly. Moving forward, I'm currently compiling a list of organizations that look promising and marking them down, hopefully to look in to them this week. If you have suggestions of a nonprofit fund for investment, please feel free to message it to me. If you have additional questions to ask about this process, please mention them in the comments or send me a private message. MOST IMPORTANTLY, thank you all so much for your support. It means a ton to us here in the community. Dealing with so many shocking losses, it's almost equally shocking to see such a massive outpouring of compassion, love and care from so many old and new friends. Your sacrifice and support is appreciated more than words can express.